German artist Wolfgang Laib, considered one of the top 100 artists in the world today, has installed his new art exhibition inside the cavernous spaces of the historic Secretariat building in downtown Rangoon. The conceptual artist creates large minimalist installations often using natural materials such as milk, pollen, beeswax, rice, and marble. Jan. 14-Feb.2, 10am-5pm. The Secretariat Building, Theinbyu St. Admission Free. Thirty-six companies will have dozens of jobs on offer Sunday at Burma’s first paperless job fair. Applicants can hunt for jobs across several different business categories. And remember! Don’t bring your paper resumes. 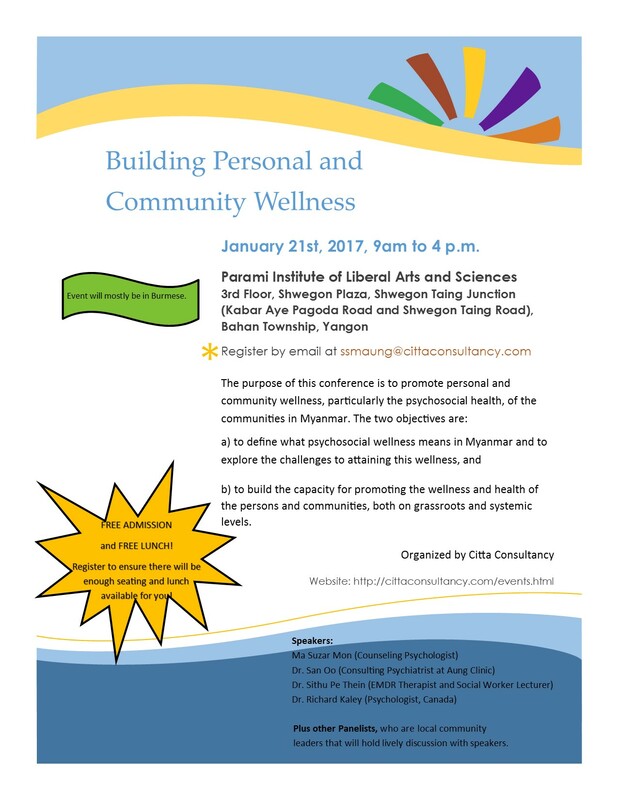 Jan. 22, 9am-4pm. International Business Center (IBC), No. 88, 6.5 mile, Pyay Road, Hlaing Tsp. The Yangon Zoo celebrates its historic 111th birthday with lots of games, an unplugged music show, a magic show, a painting competition, and so many other things. The first 111 visitors to the zoo will receive a special present. Jan. 21-25, 8am-6pm. The Yangon Zoo, Bo Min Kaung St.
Jan. 21, 9am-4pm. Parami Institute of Liberal Arts and Science, 3rd Floor of Shwegone Plaza, Shwe Gon Tine Junction, Bahan Tsp. Tel: 09-778516070. Admission free. 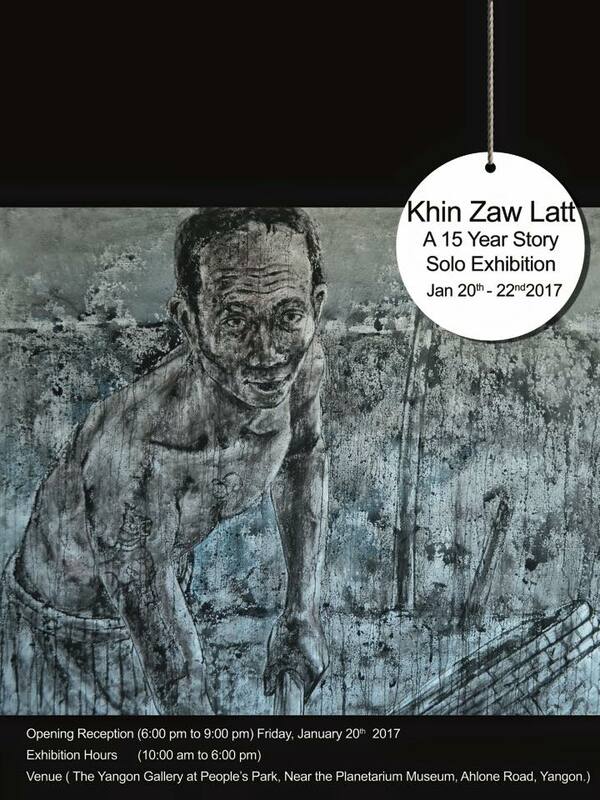 The artist Khin Zaw Latt will showcase paintings that he has assembled over the past 15 years. In July, he will also hold an exhibition in France. Jan. 20-22. Yangon Gallery, People’s Park and People’s Square. 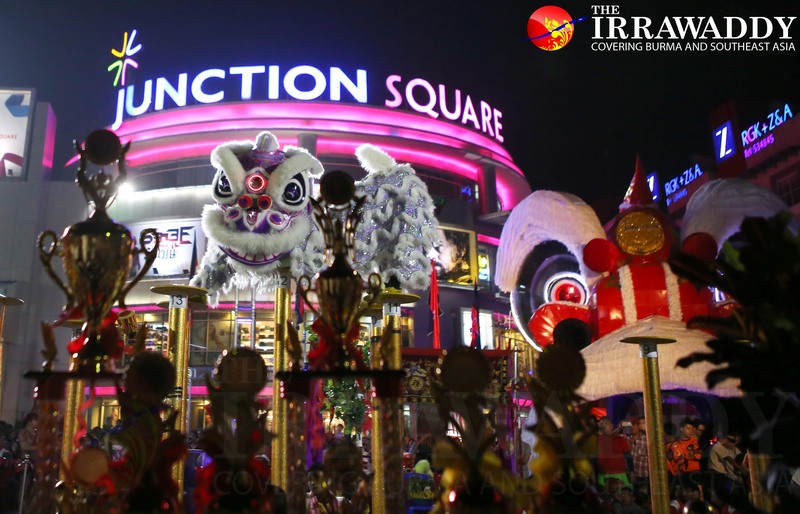 Chinese New Year will be celebrated, and dragon and lion dance competitions will be held to welcome the upcoming Year of the Rooster on the Chinese calendar. Jan 18-22. Junction Square, near Hanthawaddy Circle. 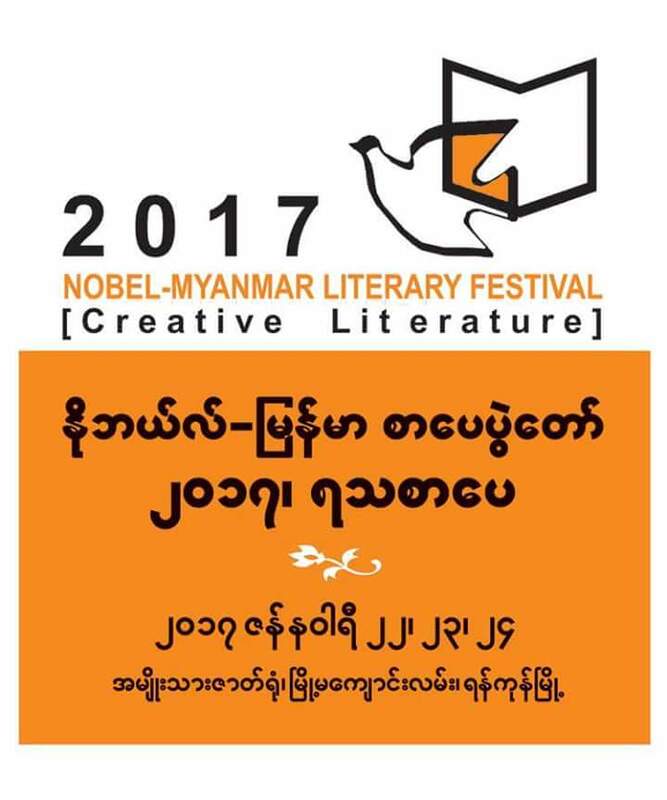 Addressing the theme of creative literature, the Nobel-Myanmar Literary Festival will feature paper-reading sessions, poem recitals, cartoon shows, and book sales. Jan. 20-22. The National Theater, Myoma Kyaung St. 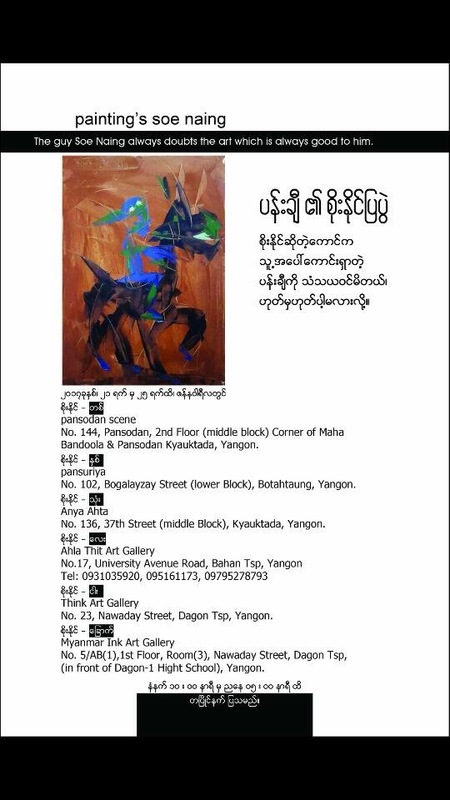 Artist Soe Naing will showcase his works in multiple galleries simultaneously. Jan. 21-25. Pansodan Scene on Pansodan St, Pansuriya on Bogale Market St., Anya Ahtar Restaurant on 37th St., Ahla Thit Gallery on University Avenue Road, Think Art Gallery on Nawaday St., and Myanmar Ink Art Gallery on Alan Pya Pagoda St. 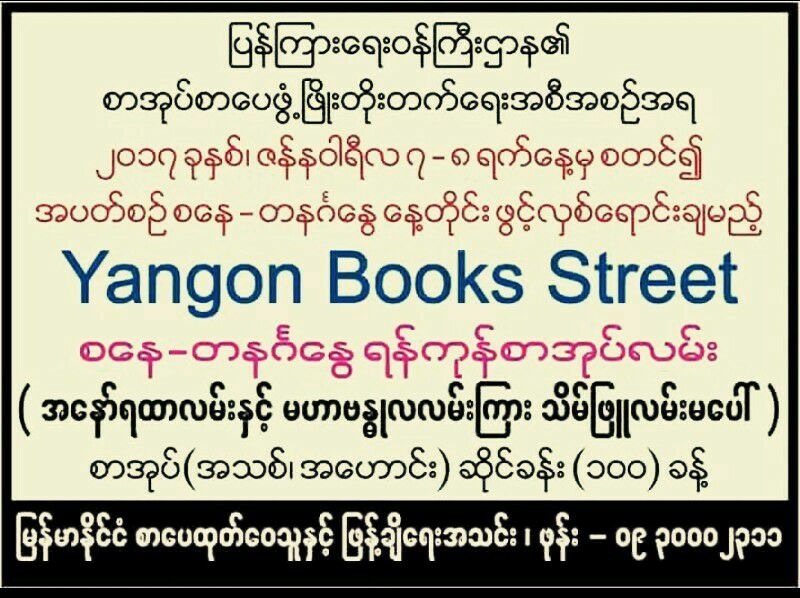 This weekly book sale is organized by the Ministry of Information and features more than 100 book shops in the same place. Many shops will offer special discounts. This memorial art exhibition will showcase the works of late artist Shein Myint, including more than 30 canvases in acrylic, oil paints, and watercolors. Jan. 18-22. The Myanmar Artists and Artisans Organization, inside Bogyoke Market.